Stomach cancer treatment in India is availed through a network of public and private hospitals. These hospitals are equipped with modern technology and a team of highly experienced oncologists (radiation, medical and surgical) and nursing staff. These hospitals make correct stomach cancer diagnosis and perform cancer staging with the help of most advanced technology in the form of PET Scan, Cyberknife, BrainSuite and Gamma Knife. 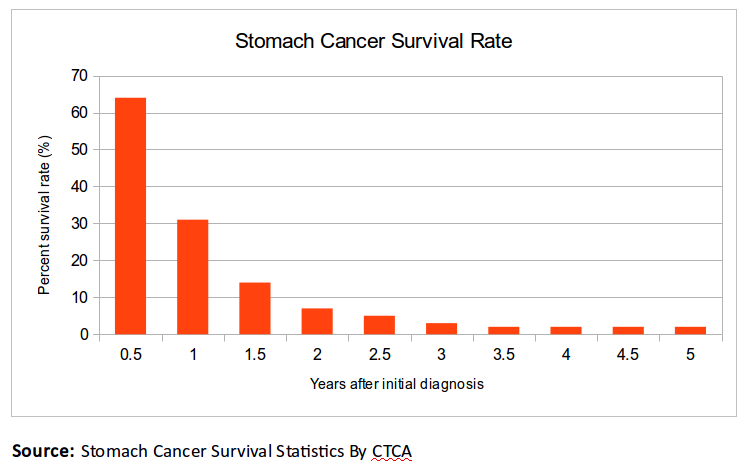 This article talks everything about Stomach Cancer Treatment In India, Stomach Cancer Hospitals In India & what is the Stomach Cancer Costs In India? It covers other popular destinations as well. This is a type of systemic therapy that makes use of a certain class of drugs to kill cancer cells. The drug is injected into the bloodstream of the patient. Thus, cancer cells located in multiple places are killed off by the drug as the blood reaches the site. Because of the ability of the drug-containing blood to reach all parts of the body, this type of treatment is preferred for advanced stage stomach cancer, in which the cancerous cells have spread to other organs and tissues as well. This is a form of localized therapy is conducted when the cancer is restricted to just one location. It makes use of high dose radiation beam to kill off cancer cells localized at just one location. Radiation therapy may be conducted in combination with surgery or chemotherapy. The lymph nodes are removed from the body of the patient in case they are also affected by cancer cells. It is a type of localized surgery in which only the part of the stomach affected by cancer is removed. It is a type of localized surgery in which whole stomach and a part of the healthy tissue is removed. Because the stomach is removed, the esophagus is directly connected to the small intestine at the end of the surgery to allow for passage of food directly into the intestine. Following the surgery, a feeding tube may be inserted to assist with normal eating habits and to maintain proper nutrition levels. The stomach heals and the person recovers in the meantime. The time it takes to recover from the surgery differs from patient to patient. While some are able to recover quickly, others take the time to recover. Some patients may feel pain, weakness, diarrhoea or constipation after the surgery. All options for pain management and control of side effects associated with stomach cancer treatment must be discussed with doctors beforehand. There are certain side effects associated with radiation therapy and chemotherapy as well. For example, higher doses of radiation may cause nausea, diarrhoea, changes in the skin in the form of redness and dryness and pain in the stomach, abdomen or intestine. Similarly, chemotherapy may make the patient prone to infections, bruising and bleeding because of compromised immunity. In addition, it may cause hair loss due to damage to the hair roots. Changes in the lining of the digestive tract may also result in diarrhoea, nausea and vomiting. Stomach cancer treatment cost India is much less than other countries, primarily because the drugs used for cancer treatment are produced within the country itself. For example, in developed countries such as the US, the surgery for stomach cancer may alone costs around $50,000. The cost can reach as high as $200,000, which includes sessions of chemotherapy or radiation therapy. However, in India, same treatment may be conducted within one-tenth of what it costs in the US and the UK. Stomach cancer results when there is an accumulation of cancerous cells anywhere in the stomach, triggered by precancerous changes in the lining of the stomach. This, in turn, leads to the formation of a carcinoma or tumour in the stomach wall. Cancer of the stomach, also known as gastric cancer, can either stay limited to its initial place of origin or invade through the walls of the stomach to reach the lymph nodes or adjacent organs such as liver, spleen, colon and pancreas. The cancer cells can even enter the bloodstream and enter other vital organs such as lungs. In addition, other organs in the abdominal cavity can also get affected once stomach cancer cells pierce through the stomach walls and the abdominal lining. When cancer spreads from the stomach to some other organ (example: liver), it is regarded as metastatic stomach cancer and not the cancer of that particular organ (example: liver cancer). A majority of these symptoms are not directly related to cancer itself. But they may result because of the effects of stomach cancer, such as inflammation and ulceration. Men are more likely to develop stomach cancer than females. 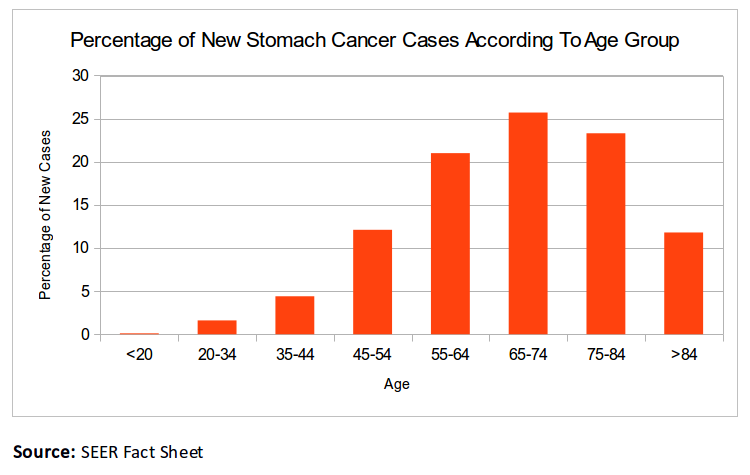 Mostly, people above 70 years of age develop stomach cancer. People who prefer to eat more of pickled, salty or smoked food are at an increased risk of stomach cancer. On the other hand, those who eat more of fresh fruits and vegetables are at a reduced risk. Stomach inflammation, discomfort and ulcers could be a result of infection from Helicobacter payroll. This, in turn, increased the risk of stomach cancer. Asians, African Americans and Hispanics are at an increased risk of gastric cancer. Family history of the disease also puts an individual at an increased risk of stomach cancer. If you visit a doctor with the certain set of symptoms that indicate stomach cancer, a doctor may like to conduct a series of diagnostic tests to figure out whether it is real because of cancer or if there is some other condition or illness. A device called an endoscope is inserted into the stomach of the patient through the oesophagus. The throat is first numbed with the help of an anaesthetic and the medicine to help the patient relax is generally given before the procedure. Endoscope helps doctors look inside the stomach of the patient and check for any cancerous formations. This is the primary form of an investigation conducted by the doctors when a patient visits him or her with symptoms. The doctor checks for external stomach cancer symptoms such as swelling and inflammation in the stomach, swollen lymph nodes and change in colour of the skin and the eyes. An X-ray of the stomach and the esophagus is conducted to check for cancerous formations. A biopsy of a piece of tissue taken from the stomach also helps doctors understand whether there are any cancer cells. So far, it is the only sure shot method of diagnosing stomach cancer. Why is stomach cancer staging done before treatment? Staging is also done in the case of cancer recurrence, which may take place in the stomach itself or any other organ. 4.1 average based on 29 reviews.